Irrigation Hose refers to the delivery hose used for landscaping, agricultural irrigation, industrial effluent, sewage system of project and other fields. The warp of the jacket is made by high strength polyester staple. And the weft must be high strength polyester filament with low elongation. The jacket should be evenly and firmly woven by circular loom and free from visible defects, thread knots, lumps and irregular twist. 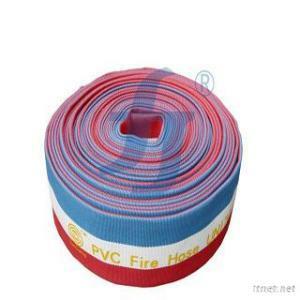 Compared with rubber fire hose, PVC fire hose is much softer and lighter. Also it has good aging proof, high adhesion strength, long using life and reasonable price. We can supply the high or low temperature proof PVC hose according to customers’requests. This kind of fire hose is commonly used in landscaping, agricultural irrigation, and indoor fire prevention system.